The trials of Captain Alfred Dreyfus took place in the last decade of the 19th century and first decade of the 20th century. Dreyfus, an officer of the French general staff, was falsely accused of passing state secrets to the German military, tried and twice convicted (1895,1899) of treason before finally being exonerated in 1906. The effects of the decade-long controversy were felt both within France and abroad for decades after the case proper was settled. 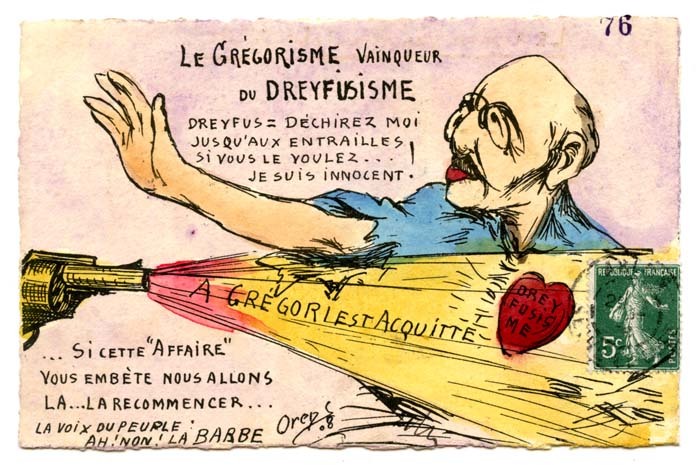 Dreyfus counted among his defenders such illustrious figures as the future French prime minister Georges Clemenceau, the celebrated novelist Emile Zola, and the social thinker Bernard Lazare. Theodore Herzl, serving as Paris correspondent for Viennese newspaper Die Welt, was disturbed enough by the anti-semitic implications of the Dreyfus Affair to turn his thoughts and energies to political Zionism, the movement which he founded. The media that surrounded the trial and its aftermath created a flurry of public commentary on the topic and is an aspect that is well reflected within this collection. 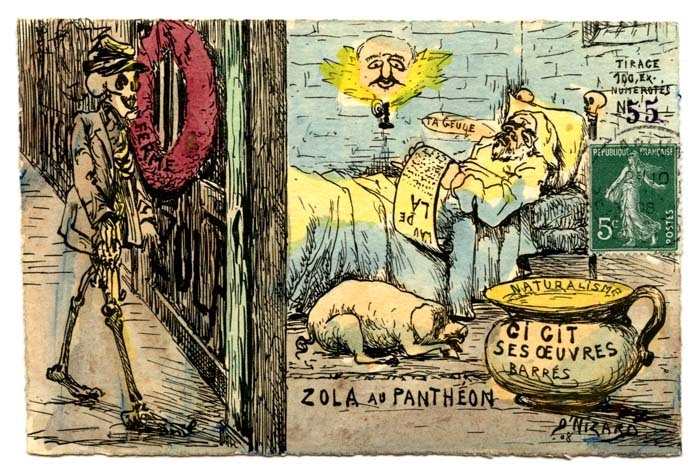 Postcards in particular were a new and inexpensive format that propelled the scale of popular opinion expressed through their mass-circulation and often time provocative, anti-semitic imagery. The JPL holds a collection of over one hundred postcards that were produced during the events of the Affair and in the years following. A selection of these postcards are presented here representing particular artists as well as series. The entire collection is searchable through the Canadian Jewish Heritage Network.